about this book: Are you looking for tips and techniques that really work? Ten award-winning authors offer their expertise in areas they've learned the hard way - by trial and error and finally success! In some chapters, everyone shares their method, so you can pick and choose a style or a little of each, if that's what works for you. Scene Endings to Lead Your Readers On, Creating a Movie Set, Making your Readers Cry, Deep POV, Copyediting your Manuscript, Indie Publishing vs. Traditional Publishing, and Marketing for Those Who Hate Marketing. 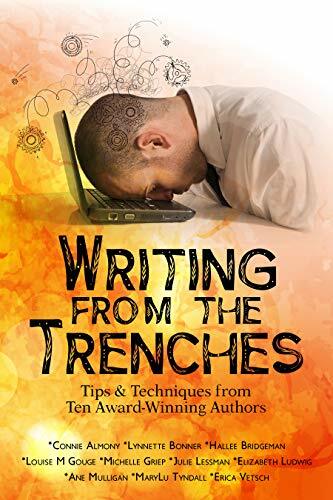 At last … a writing book that provides the experience and expertise of ten authors who've been on the front lines of publishing and lived to teach about it: Connie Almony, Lynnette Bonner, Hallee Bridgeman, Louise Gouge, Michelle Griep, Julie Lessman, Elizabeth Ludwig, Ane Mulligan, MaryLu Tyndall, and Erica Vetsch.